I went on a brief origami binge a few years ago. I was obviously trying to punish myself for something. I found a couple of my creations tucked in a corner. They really didn’t come out too badly, but I remember that making them was tortuous. Folding and creasing, pulling and folding. Sighing and folding. Clenching my teeth and creasing. Refolding all the folds that I didn’t fold straight enough. Balling up the paper and throwing it away because my bad folds and creases ensure that my poor crane will look like something you’d find dead by the side of the road. After tossing out a half a pack of paper, I was able to produce a passable crane and swan. Once I proved to myself I could do it, my origami period was definitely over. 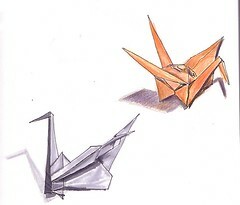 I admire people who have the patience for origami. I love looking at the results, even if I hate to do it. I’d rather just draw the things. me either I don’t have patience with these stuff !! Glad I’m not alone. Thanks for stopping by doudy. Chris, I’m glad someone enjoys it because I really do love origami. Doudy, I linked back to you. I want to keep track of your watercolor progress. Thanks for adding me to your Technorati favorites. I really appreciate it. Being a perfectionist sometimes, (not always in my best interests!) I don’t do origami either. and never considered drawing it, until I saw your drawings. You make these creatures look, similar to Pinocchio, one step away from being alive and real. Also kind of scary. Like once they come to life they need to Eat. Nice work! Kris, I am not surprised by your vivid imagination. I can now see that too. Once I finish one they perk up and start pecking at my hands and making a horrific racket. Glad you like the drawing. Lately I can barely figure out how to do the simplest things involving spatial relations so origami would be hellish for sure. Much better to draw the already folded origami! My biggie hands are way too impatient too fold paper to make cute cranes. Your drawing is super rad by the way!